Let’s say you buy an ounce of Cascade hops and it says 6.0% alpha acids on the package. What is the percentage of alpha acids in your hops? This might seem like a trick question, but it isn’t. 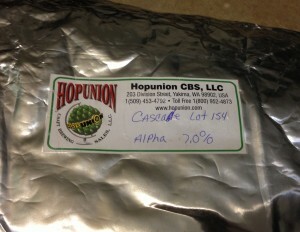 Alpha acids decay over time and the percentage listed on the package represents the level when the hops were analyzed. The number may be substantially lower when you brew with them. In each hemisphere, hops are harvested once a year. Once harvested, the clock is ticking on their alpha acid levels. For advanced homebrewers — especially those brewing hoppy beers in the few months leading up to the next hop harvest — it pays to understand what is going on and how you can adjust for it. The major variables contributing to the decline in alpha acid levels are temperature, exposure to oxygen, exposure to light, and the variety of hops. As a homebrewer, you should store your hops in a way that minimizes their degradation. When storing hops, the colder the better. Increasing the hop storage temperature by 27 °F (15 °C) will double the rate at which the alpha acids are lost. For most homebrewers, this means that his or her hops should be stored in a freezer. A dedicated freezer is preferable to the frost-free freezer found in most home refrigerators. Frost-free freezers work by periodically letting the temperature rise above freezing, thus letting the frost in them melt. Of course, this also means that the temperature of your hops will occasionally rise above freezing. If you don’t have a “frosty” freezer, you can store your hops in a bag or box filled with crushed ice that is placed in your freezer. The ice surrounding the hops will buffer the temperatures the hops actually experience somewhat. Oxidation causes hops to lose alpha acids and acquire a cheesy aroma. In most homebrew shops, hops are sold in oxygen-barrier bags that have been flushed with nitrogen. Freezing these unopened bags will keep the hops in a good shape for a long period of time. Once you open an oxygen barrier bag — or if you buy hops not packaged this way — you can flush a mason jar with CO2 (presuming you keg your beer) and store them in that. If you don’t know whether the hops are bagged in an oxygen barrier bag, try sniffing them. If you can smell the hops through the packaging, oxygen can get to them. Pellet hops store better than whole hops. Even when exposed to oxygen, the material in the interior is somewhat protected from oxygen as it takes time for the oxygen to diffuse through the compressed solid. In whole hops, the lupulin glands are fully exposed to whatever gas surrounds the hop. Oddly enough, when beta acids (another component of hops) are exposed to oxygen, they become more bitter. This partially counteracts the loss of bitterness due to the loss of alpha acids. Light is generally not a problem at home, as freezers are dark inside. However, hops may be stored in a lighted case at a homebrew shop. If the hops are bagged in a clear bag, the exposure to light is hastening their alpha acid loss. Different varieties of hops lose alpha acids at different rate. If you go to the websites of hop merchants, they list the rate of loss typical for each variety. This is expressed as the percentage of alpha acids remaining after 6 months when the hops are stored at 68 °F (20 °C). For example, Hop Union lists Cascade as retaining 48–52% of it’s alpha acids after 6 months. Percentages of remaining alpha acids varies from 45–85% across the most popular varieties of hops. The paragraphs above explain how to minimize alpha acid loss once the hops are in your hand — essentially, freeze them and don’t expose them to air. One additional thing advanced homebrewers may want to consider is buying their year’s supply of hops in bulk as soon as this year’s harvest is available. The hops can then be repackaged (if needed) and stored under ideal conditions. If you do this, there is no need to worry about how the hops were handled before you acquire them. In the next installment of this article, I’ll give two ways to estimate current alpha acid levels from the harvest time measurement and storage conditions.